Embattled British Prime Minister Theresa May’s crisis over Brexit in the UK Parliament has worsened as House of Commons Speaker John Bercow disallowed any attempt to hold a third vote on her withdrawal agreement with the EU, which has already been voted down by MPs twice. He said parliamentary conventions dating back to 1604 meant MPs could not be asked to vote on precisely the same subject twice, indicating that he had allowed the second vote as the government had claimed some changes to the controversial Irish backstop clause offered an improved deal for Britain’s exit from the EU. “It is a necessary rule to ensure the sensible use of the House’s time and the proper respect for the decisions which it takes,” Bercow said. The speaker, who is in charge of selecting the motions and amendments that the Commons votes on, said the second meaningful vote motion on May’s Brexit deal held last week did not fall foul of parliamentary convention because it could be “credibly argued it was a different proposition” to that rejected on January 15 because of changes the government considered to be legally binding. 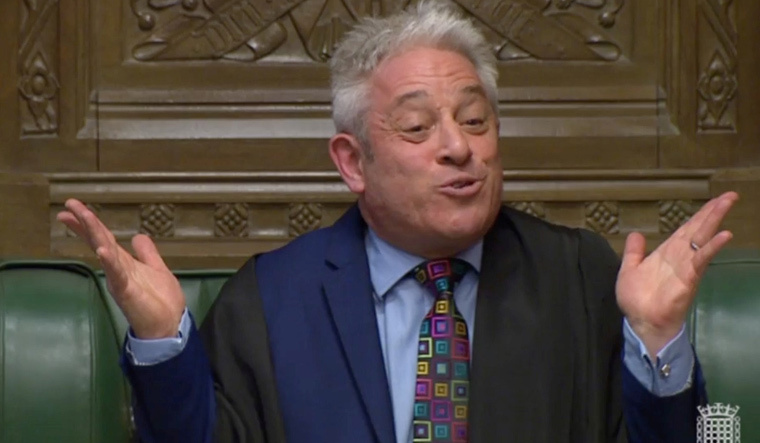 Bercow’s latest ruling comes as a fresh blow to May, who had been hoping she may get third-time lucky if she could win over enough rebellious MPs by warning that Brexit itself was in jeopardy unless she can go back to the EU with a substantial deal in place. May is set to head to Brussels later this week for a European Council summit where EU leaders will contemplate agreeing to an extension of the March 29 Brexit Day deadline. May had been hoping to seek a short extension until June 30 if her withdrawal agreement had cleared the Commons in a third vote before that meeting. However, the likelihood of the EU agreeing to a short extension under the current scenario will prove tricky, and any longer extension would mean the UK contesting the European Parliament elections scheduled towards the end of May. The many opponents of the British PM’s Brexit deal welcomed Bercow’s ruling, while others feared it had triggered a constitutional crisis just days ahead of the March 29 deadline. While MPs have also voted against leaving the EU without a deal in place within that time-frame, March 29 remains the default exit date unless the economic bloc ratifies an extension and it is then voted into law in the UK.